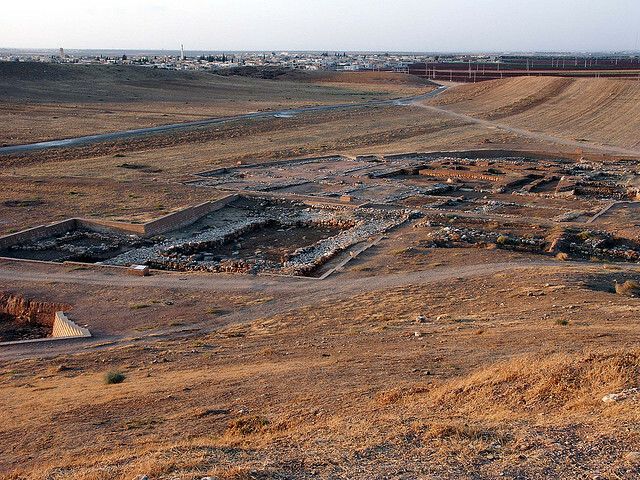 One of the most popular articles on this blog is The Ebla Tablets Confirm Biblical Accounts. Though it was posted in 2015, it was still the most read article on the blog in 2016 and 2017 and was still third on the list in 2018. Perhaps, that is why I feel prompted to revisit the subject today. What is the Quantum of Proof Necessary to Believe a Biblical Account? I previously wrote a piece on the city of Jericho of biblical fame that was inspired by a presentation given by an archaeologist, Ted Wright, who excavated at tell es-Sultan, the modern site known formerly as Jericho. He commented that archaeology is not really divided over issues like whether Jericho existed. Rather, archaeologists differ on the chronology they find in the story of the stratified remains of prior habitation. That issue of timing regarding the destruction of the city of Jericho was the focus of the previous blog. There is no doubt that Jericho was surrounded by a double wall of which the interior wall collapsed on the outer wall, forming a virtual ramp up into the city. The city was also clearly destroyed by a conflagration (fire). The only question is: when did those events that are evident in the rocky soils on the site took place? The first archaeologist to dig at the site reached the conclusion that the city of Jericho was destroyed in the early bronze period, well before the Israelites may have come upon the heavily fortified City. According to the first assessment, Jericho had long been uninhabited by the time the Israelites arrived. Subsequent archaeological digs revealed disputing conclusions. John Garstang found evidence in the 1930s that Jericho was destroyed around 1400 BC, exactly the time frame of the biblical account. Subsequently, archaeologist, Kathleen Canyon, came to the opposite conclusion, reaffirming the earlier opinion that the city was uninhabited by the time Joshua and his combatants came along. But wait… there is more. The most recent archaeological findings, seem to suggest that the biblical timing is correct. Kathleen Canyon apparently ignored and failed to register the significance of Late Bronze period pottery that would not have been found in an area that was uninhabited by that time. Many factors that she missed reveal the error and suggest a date consistent with biblical chronology. (See Believers Score in Battle Over the Battle of Jericho, by John Noble Wilford, published February 22, 1990, The New York Times). The story of the excavation of Jericho reveals how archaeology and interpreting what we find is sometimes highly influenced by what we believe about history. The same finding can suggest different conclusions, depending on what we are looking for (or not looking for). The difference as Ted Wright suggested, isn’t in the what, but the when. The Bible, of course, has many fantastic stories in it. They are so fantastic, that many people simply find them incredible, as in not credible at all. Believers are told to take the stories on faith. Skeptics take the opposite view and reject them, hook, line and sinker (to turn a phrase). There is evidence consistent with belief that the stories are true, but insufficient evidence to prove them beyond a reasonable doubt. Should modern archaeology require something more than reasonable doubt simply because the biblical accounts have a miraculous, religious bent to them? This is the second in a two-part blog series inspired by an interview with archaeologist, Dr. Craig Evans. The first article was general in nature, focusing on people in the biblical record who are confirmed by archaeological finds, and noting that modern archaeology continues to affirm the historical reliability of the Bible. In this piece, we focus on the New Testament, which is Dr. Evans’s specialty. Significantly, when asked whether he is aware of any archaeological finds that contradict the Gospels, Dr. Evans responded, “Where it relates to the Gospels – the Gospels talk certain people, certain places and certain events – and everywhere archaeology has any relevance that touches on it in any way, the archaeology supports what the Gospels say.” Thus, the theme continues: that modern archaeology, far from casting a shadow of doubt on the bible, shines light on it, illuminating the biblical accounts with archaeological discoveries. I recently listened to an interview of Dr. Craig Evans, who wrote the book, Jesus and the Remains of His Day: Studies in Jesus and the Evidence of Material Culture. The book is described as a collection of articles demonstrating how archaeological evidence “enlightens our understanding of the life and death of Jesus and the culture in which he lived”. The interview focused on archaeology, generally, and especially on the way archaeology sheds light on the New Testament. In this piece, I am following up on the more general discussion. When asked if he was aware of any finds that have failed to support the biblical record, Dr. Evans could not think of any. Rather, he commented that archaeological evidence is found every year that confirms the biblical record. Of particular note are the people mentioned in the Bible that archaeology has affirmed. Bible skeptics often talk as if there is a dearth of evidence that any of the events in the Bible took place. Skeptics consider the Bible, and especially the Old Testament, as fictional, a fanciful product of the imagination trumped up many, many years after the actual events took place, and full of places and characters that never actually existed. The Ebla Tablets found in Northern Syria tell a different story. When skeptics claim that Bible believers are biased, they are right. The truth is we all are biased, skeptics included. Some may be more aware of their own bias than others, but we all have our biases.